MULTI FLAME EFFECT: Dimensions-23L x 10W x 20D in. TS23 has a bigger size and more realistic blue and red mix flame effect with adjustable brightness. 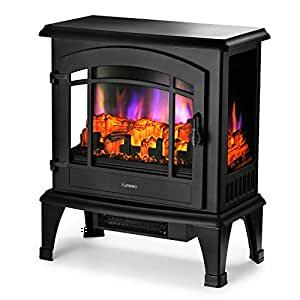 Decorative furniture with elegant freestanding fireplace – realistic dancing flames and burning log effect from every angle through panoramic glasses. ENJOY A WARM WINTER: The 1,400W/4,780BTU powerful heating capacity warms up a room of 1,000 sqft within 5 minutes. Light off with heat-only function, you can have a good sleep under comfortable temperature without lights disturbance. FAST INSTALLATION & EASY CONTROL: All you need to do is to fix the legs to the body by a screwdriver, and itâs ready to use. Simply control it with only 3 buttons without reading the user manual again and again. 1-YEAR WARRANTY: Please note that the ânew smellâ for the first use or after long-time storage is normal and it will be gone soon. Please check the package first when you receive it, any damages or missing parts please feel free to drop a message at support@turbro.com. Check Your Package: If you find the package is destroyed or lose the accessories, please feel free to contact us at support@turbro.com. Safe Use:For safety concern, please DO NOT use the extension cord and power strip. Avoid Burning: DO NOT allow bare skin to touch the air outlet of the heater. Limited Product Load: Please DO NOT place heavy items on the top (several decorations only).